ABS-CBN’s FM station in Mega Manila Tambayan 101.9 has announced the nominees for the 3rd Tambayan OPM Awards or TOPMA led by Angeline Quinto, Kamikazee, Erik Santos, and Vice Ganda as it formally opens the text voting to the public to determine this year’s winners. This year’s TOPMA is now bigger as Tambayan 101.9 partners with all the sixteen M.O.R. FM stations of ABS-CBN Regional Network Group, to promote and encourage listeners to vote for their favorite songs or music artists. “Star Power” grand winner Angeline Quinto earned the most nominations in the roster as she was nominated in the Song of the Year, Album of the Year, Female Artist of the Year, OPM Revival, and Best New Artist categories. She is followed by Erik Santos and Vice Ganda garnering three nominations each. Meanwhile, Tambayan 101.9 will once again recognize an artist and/or song writer who has helped change the OPM industry and has been a true champion of Filipino music through the Tambayani award. The first Tambayani awardee was the late rapper Francis M in 2010 followed by Charice in the succeeding year. Winners of the TOPMA will be revealed this June 30, 2012. 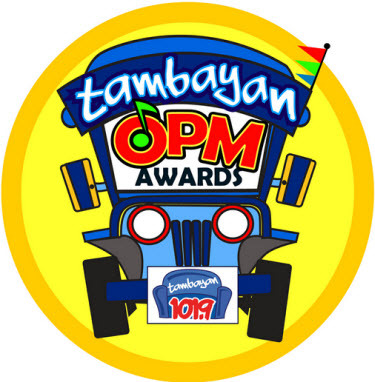 Tambayan 101.9 is currently on its third year of recognizing Pinoy artistry in music. Recently, TOPMA took home an Anvil award from the prestigious Public Relations Society of the Philippines (PRSP). TOPMA successfully paid tribute to Filipino music artists by honoring original Pinoy music and engaged its listeners and provided an avenue for its DJ’s to interact with them during the awarding event.